The latest issue of Reader’s digest is out and we were waiting for reviewing the same. 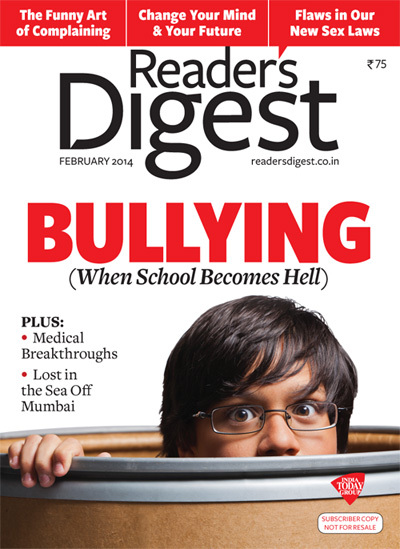 Here are the details about the Reader’s Digest India February 2012 Issue. I like the starting of the editorial by Mr. Sivanand. He notes that it is observed that whatever happens in the west, it reaches to India. Sometimes it take time. But it reaches. However that is not always for good. Don’t think anything else, the stuff is mentioned in terms of the Heart Decease. For the long time it was considered as man eater, but now women also found caught with heart decease which lead them to the death more frequently. The central article is written about the same. We hear a lot of quotes about a friend (a true friend of course), which says something like; friendship is important as you choose your friend (however you can’t choose your family, so sometimes those relations can be sour). A nice quote I found in the “Quotes” section is “You don’t choose your family. They are the God’s gift to you, as you are to them.” If we believe and behave like the same; really most of the family problems will be overcome easily. As attitude is the main thing. Of course, there are some other nice quotes too. In “@ Work section” two joyous incidents are the answer of a kid that “X-Ray is used to teach Maths” and a child quoting about The (meeting) Boardroom that, “Now I know why you call it the bored room”. Read it for details and it will spread a smile on your face. Self discipline and self control is necessary when use anything. In one incident, a youth talking on the cellphone, unaware of the surroundings (as cannot hear sound of the vehicles etc – while concentrating on phone), in Banglore (Bangluru) run over by a train! We see a lot of pedestrians now use the cellphone either to listen to the music or talking to someone continuously by using headphones etc. It makes them vulnerable to the traffic, as their concentration is on the talk not on the traffic signals and horns etc. Hope this incident will open eyes of the people and it will be resulted in saving at least some lives. Now a days, Global warming, Environment awareness and similar stuff gets attention of more and more people. Unless everything on the planet earth will be in the balance, things will surely misshapen. In the Greenheart segment Bittu Sehgal comes with an article titled “Let’s Respect Our Seas”. He came up not with the abstract things but with stuff with the factual information. In My Opinion – this section have the story of Simon Dolan. The tale is titled as “Want to be a success in business? Avoid university”. The author also suggested four books to read if you plan to go business way. 1. How to win friends and influence people (by Dale Carnegie) 2. Action! Nothing happens until something moves (by Robert Ringer) 3. Atlas Shrugged (by Ayn Rand) 4. How to make millions without a degree (by Siman Dolan himself). The article speaks at the extreme level and in my opinion you read it with maturity. While summarizing from the title itself and getting the meaning we wish, it is important to understand that it means thinking out of the box. Degrees are not the only important things which lead you to the success always. But however make sure that you understand the importance of the eduction in the broad meaning. The story explores the importance of courage, entrepreneurship and other qualities you need to have, to be a success in the business. The importance of education cannot be avoided anyway. Many of the Indian culinary words became the part of English language (Eg. Basmati, Chutney, Tikka and others). Similarly France also made the heavy impact on food related vocabulary (Eg. Cuisine, Menu, Restaurant and others). Find the meaning and brief about words in the “Word Power” section along with some good to know information. Norman Yammine have been behind the bars since long. His story is there in “My Story” section with title “The walls that changed me”. He never dreamt that imprisonment would have upside. But he got life changing experience there. His story explores his changed attitude towards the life and its aspects. There is no denial that every crime should be paid. But we must remember that a criminal like Valiya can be sage Valmiki. Though not much in-depth actual details are there in this article but some one liners are good. An article about a lot of warnings we see everywhere including TV is not a satirical stuff only but to think about it also. The petrified woman – by Lenore Skenazy is we are talking about. She has written it not from the real life experiences or so, but after spending a week in front of the TV set she got to write it! It was a nice article but as per my personal opinion it could be ended or summarized in a better manner. Kamala Thiagarajan wrote the article about rising number of heart-attacks in women of India. In addition to the quotes from the meeting with several doctors, some factual figures are also there which makes the article more informative. Some facts are obvious and well known but somehow overlooked. E.G. : we know that the stress level is remarkably high for the current generation and women are not exception to that. They are also having increased stress level and home and workplace both the front, which leads to the heart-attack. Routine checkups are mostly avoided or ignored based on the busy schedule and the fast food etc we need to eat sometimes with necessity too, leads to the growth of cholesterol. Overall ignorance plays a vital part here. A good read. Long before I rad a short story about a doctor’s experience. He was traveling via a bus and he saw a young couple in love as co-passengers. The way they were taking care of each other was really great. He then reached his home where he found his wife (who was also a doctor) running on a busy schedule too. Instead of being romantic or talk to him for long by having hand in hand, eye-in-eye; she did whatever is best for them, and after a warm gesture she left. Inspired by seeing the love birds in the tour, the doctor was expecting something more. Of course doctors are humans and they too deserve more love, passion, togetherness etc. like all of us. He then have had busy day. Next morning he needed to woke up early to finish some important stuff. But as he was dead tired, he slept till late. When he woke up late his wife was already left for the clinic. He was worrying about the stuff he needed to complete; but he got to know that the stuff was already done by his wife! He then thought, what is love? Is it walking with someone by having hand-in-hand, talking to someone having eye-in-eye, sing with someone matching the voices, be at a long drive…. or taking care of each other without even any show-off?! Well, I remember the story as the Valentine’s day is coming in the February and an article titled Smitten reminded me the same. The article explores four stories. The stories are from around the world and the theme of all them is love. The love for each other regardless the physical distance or illness. Titles of the stories are “Love’s perfect circle”, “Love beyond boundaries”, “Ageless love” and “Love knows no hardship”. It is a nice read. Apart from some interesting facts about the Valentine’s day, an article about the traffic sense is also there. If you explore some recent issues of Reader’s Digest India, a small article about traffic and traffic will be found in almost all the issues. Well, of course, traffic sense is needed thing and we must have discipline while driving. With the growing number of vehicles, the number of accidents are also grown. Someone said that Driving is not your right, but you responsibility. If everyone follow the phrase, a huge relief in terms of traffic chaos will be there for sure. The article have a photo showing a flyover, where we see the board saying two wheelers not allowed on the flyover and yet we see a number of people on the two wheeler are driving there. Avoiding such safety warnings and cautions leads to fatal stuff. Eye opener. The adventures cannot be made at the comfort of a home, you need to go out. Fascinated about voyages! Heard about Sindabad, Gulliver and others; and planning such adventure? A group of four people planned such tour of four months to the Caribbean. It was a dream come true for them. But they caught in a storm later. How they survived and what they learn from it; is explored well in the adventure tale ” Journey To Hell”. Sounds fascinating! What if you hear all these ideas and many more are patented by a single person! Tony Cuthbert is the genius behind all these ideas. He says that he have no shortage of new ideas. Usually people, when make a new invention or something, they do not disclose it to the friends or peers too. They first got the patent registered etc. Otherwise, stealing the ideas of other and work on them by claiming a fresh new approach of own, happens since old days. However Tony doesn’t care much about that and he keep his idea conveying to the people before applying for the patent. He is considered as one of the most prolific and brilliant inventor of UK. Ever wondered why you haven’t heard about him? Why his ideas aren’t put into practice yet? Well, read the article “Patent Genius” about him. A bird lover or not you will find the article “Swan Serenade” interesting. The photos attached are cool too. The facts mentioned are interesting too. The article by National Geographic team have its trustworthiness too. An article titled “Tasting Safari” is about various non-traditional (and not acceptable by a lot) dishes and food festival is there. If you are a vegetarian you may like to avoid the article. It explores some dishes, you may find awkward or even disgusting sometimes, based on your personal take. Though people around the world tries something different, much opposite to even you can imagine sometimes. Wanna be rich? Well, who doesn’t? A series of motivational and inspirational books about having joy, success and other stuff are there in the market and they are huge hits almost always. An article about How to feel rich may interest you. A perfect storm by John Dyson is about cosmic hurricanes and solar flares which can disturb the magnetic shield of the earth, disrupt power grid, communication, GPS based device and… in short the life. And interesting read. The facts he have mentioned, cannot be overlooked too. Its a wonderful life by Charles Kulnder (a National Geographic Traveler) explores the special relationship the Barbadian have with each other and their island. Get more information about this fabulous island and its fantastic people at http://www.barbados.org. When Valentine’s day is approaching, everyone is talking about love, well that’s good and obvious. Love is one of the best feelings of course, without a doubt. But remember that conflict and a small fight over it between the couple is not all that bad as people think. It is actually something good which makes the relation healthier. A small take to that is there in this issue. Speak Easy section have some trick for tongue twisting for right pronunciations. Some interesting words related to food and drink, and music and movies are presented with the guideline how they should be spoken. It is interesting because see everyone loves food and want to try varieties there. Cooking shows play a vital part in extending culinary boundaries and we got to know about new cuisines and food items. Knowing them how to pronounce it properly is definitely needed. Other important stuff which do not have any boundaries is Music and Movies. Some movie name, phrases in the movie, surnames of the actor and much more sounds something different to the one who lives in different geographical territory. So its worth knowing that to speak it correctly! A small yet good section. Wish there were more stuff here! The book bonus section explores the tale of Paul McCartney the legendary former beatle. He is a well respected name and there are women who were in his love. But his quest to find the true love seems non-resultant. Details explored in the article. In addition laughter and other sections are there. Overall a balanced material available to read. Of course, much much better then reading something abstract for timepass. This is a cool choice.